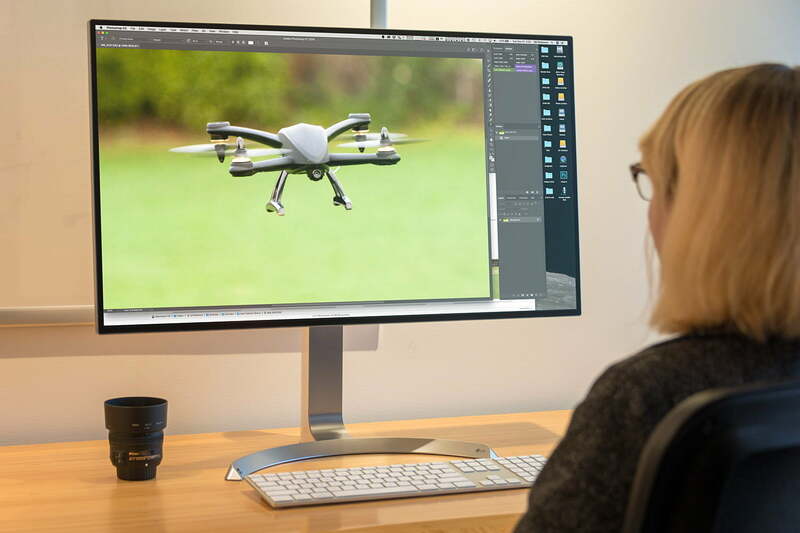 Computer monitors are starting to support high dynamic range (HDR), which means they can handle more detail in the brightest and darkest parts of an image, along with a wide color gamut. HDR has proven a revolution among HDTVs, and every high-end television now supports it. While it still has issues with Windows, it’s definitely a feature people are looking for in high-end monitors today. If you want to be prepared for the future, here are the best HDR monitors you can buy. Alternatively, our best monitor guide provides a few non-HDR alternatives for your computing experience. It’s rare to find a monitor that ticks all of the boxes for almost any user, let alone one that does all that and has an affordable price tag. In BenQ’s EX3501R though, we may have found such a unicorn. At 35-inches of beautifully curved VA paneling with an ultrawide resolution of 3,440 x 1,440, it is stunning to look at. It also supports a 100Hz refresh rate, 4ms response time, support for 100 percent of the sRGB color gamut, and most importantly for this buying guide, an HDR mode. Like some of the other top-tier entries in this list, the collection of high-end features BenQ has packed into the EX3501R makes it great for editing photos, watching movies, and gaming. It’s fast and responsive and thanks to the combination of a great contrast ratio (2,500:1), a brightness that hits 300 nits, and that HDR support, it looks fantastic no matter what you’re doing. FreeSync support keeps screen tearing at bay without a performance hit and the monitor even helps your desk stay tidy too, thanks to a USB-C connection for power and data transfer. You can get all that for an excellent price, which puts some of the other entries in this list to shame. If the additional screen real estate gained from an ultrawide monitor entices you, our best ultrawide monitor roundup could provide some additional options for your desk setup. Read our full BenQ EX3501R review here. Samsung CHG90 is a real monster at 49 inches diagonally, with a 32:9 aspect ratio and 3,840 x 1,080 resolution. It’s akin to placing two 27-inch, 1080p monitors side-by-side, but without the bezel. The technology inside the CHG90 uses quantum dots to deliver great contrast, a wide color gamut, and solid color accuracy. Its image quality isn’t as sharp as others, which is the CHG90’s main weakness. However, its quoted brightness is 350cd/m2. VESA recently certified it as the first DisplayHDR 600 monitor. The panel even has FreeSync support, and refreshes at 144Hz, so its good for fast-paced games. Though its MSRP is rather high, recent sales have dropped the CHG90 to a much lower price point. It’s still a lot of money, but given its incredible size, it’s now reasonably priced. If you want a huge, HDR-compatible screen, this is the one to buy. If your budget doesn’t quite stretch that far but you still want the Samsung quality for your HDR display, there’s also the equally great CHG70 that’s worth considering. Read our full Samsung CHG90 review here. The top monitor we recommended is an ultrawide – great for gaming and movies, but not everyone’s first choice. If you want a more traditional, 16:9 screen, the LG 32UD99-W is a good pick. It offers a 31.5-inch, 4K panel, along with HDR10 support and a wide color gamut. Our testing found it offered decent contrast, a wide color gamut, and good color accuracy straight out of the box. Yet the LG 32UD99-W seems best for people who don’t mind getting their hands dirty with technical details. It offers a wide range of settings, and its color accuracy goes from good to outstanding after calibration. LG also promises a maximum luminance of 550 nits. In our testing, we saw up to 360 nits. That’s better than average and it means the LG can handle detail in HDR content better than most HDR displays. It’s a 4K screen too, so you can view 4K HDR films just as you would on a television. The downside is the price, which can approach a grand, depending on the retailer. Read our full LG 32UD99-W review here. Most of the great monitors on this list are expensive. Most people can’t justify spending as much on a monitor as they might on a television. Luckily, the new Acer ET322QK offers an affordable choice. With a delightfully low price at most retailers, you might expect compromise on size and pixel count. Not with this monitor. This Acer is a 32-inch, 4K display with AMD FreeSync support for gamers, though the panel refreshes at the usual 60Hz. So, what’s the catch? We haven’t tested the ET322QK in our office, so we can’t say whether its color accuracy or gamut match its contemporaries in this list. What we can say, though, is that Acer only quotes a brightness of 300 nits. That’s lower than some, but comparable to our top-entry, so it’s perfectly passable. Still, it’s hard to ignore this monitor’s feature set and bargain price. This might be the compromise budget-minded buyers are looking for. Asus is typically known for its gaming monitors and that doesn’t change with the PG27UQ, where it brings together all of the top display features to create a high-end gaming monitor that will be the envy of everyone at LAN parties. Combining 4K resolution, with a 144Hz refresh rate, and quantum-dot technology on an IPS panel with full HDR support, and G-Sync to back it all up — you can’t ask for much more. Admittedly, this display is a little smaller than the others on this list at just 27-inches, but PC gamers rarely go much larger so the sizing is quite deliberate. If you’re looking for an HDR monitor to make your games look prettier and don’t want to sacrifice anything to get that feature, there’s nothing on this list quite like the PG27UQ. All of that technology and quality does come at a cost though; The price tag is listed at almost two-grand with some online retailers offering the monitor for a bit less, so this one isn’t as easy to recommend as some of the much more affordable offerings on this list. If you’re looking for other options to take over the battlefield in your next firefight, be sure to check out our best gaming monitors and best monitors with NVidia’s G-Sync technology. All the monitors above are good picks, but don’t expect them to match today’s HDR-compatible HDTVs. PC displays aren’t bright enough to make the most of HDR. You’ll see more detail than you would in a non-HDR monitor, but extremely bright scenes will still look washed out, and colors won’t pop as they do on a quality television. We’ve mused more on the subject already, but in the end, we suggest you pick the monitor that’s best for you overall, and treat HDR as a nice but unnecessary bonus – for now, at least.